Well, the Calico Critters Luxury Townhome is a conducive plaything for your kids so that they learn and get entertained at the same time. Dollhouses are one of the toys that children really love to play with. Not only do they imagine that they own their own house and control the household, but they can also make up their personal stories and problems that they handle by themselves. Children love to play with their imagination, and that is why they should have toys that encourage them to use their creativity and imagination. This way, you induce them to explore and play around using imaginative characters and stories. The Calico townhome for Critters is a luxurious dollhouse from the outside to the inside. It is made with incredible detail to make everything realistic. What makes this house unique are the creatures that inhabit it. Instead of Barbie or miniature school pupils, this magnificent townhouse has toy animals that live in it. The families of Critters will enjoy living in this fabulous home. It has four bedrooms with doors that can be opened and closed. There is also a room divider so you can create another room, the fifth one, if you want or if there is a visitor in the townhouse. The movable staircase is also a fascinating part of the house because not all dollhouses have it. The details of the house very much look like your own so that your kid can associate real life into the play. The townhome is available as the separate unfurnished home (described in this article) or as a Gift Set. The gift set also includes 2 Critters – Sweatpea Rabbit Nikki and Rebecca, dining set, piano and bench, desk, kitchen stove, pan, cart with appliances. With the crazy life of parenthood and everything, it brings, finding the perfect toy that’s fun for your child and satisfactory for you can be as frustrating as it is costly. It’s a fact that kids lose interest in playthings as quickly as the time it takes them to break one. I set out to find a toy that’s entertaining enough to keep kids interested for a long time, sturdy to withstand some hurling and educative. In my search, I came across the Luxury Town Home playset. It is part of the Calico’s Critters series released in February 2007 and offers a refined and stylish two-level miniature townhouse designed to promote developmental learning through active play. And it retails mainly on the brand’s website and Amazon. Please keep reading the summary of my findings from buyer’s feedback on the product. Almost all the customers were satisfied with the packaging. They described the playset as cute and arrived in excellent condition. Only a couple of customers mentioned some breakage due to shipping manhandling, but for the rest of the buyers, it was just perfect. It’s fun guaranteed. The Luxury Town Home was highly rated in entertainment. Most customers remarked on how their kids loved the playset on sight and still haven’t lost interest in it after years, which is a lot to say for a toy. It’s been noted to be mentally engaging and keeps their kids entertained for hours; long enough to keep them out of trouble and buys parents the much needed “me-time.” It is also easy to assemble. The versatility of the decore feature in addition to the downloadable wallpaper scored high marks for inventiveness and creativity; which encourages imagination. The playset ranked high for sturdiness and durability. It’s been noted to survive some fair amount of rough handling from their kids, which is particularly essential for the age range it was designed for. Some parents remarked the toy stayed long enough to be passed onto younger siblings. A couple of buyers were concerned about a wobbly the 2nd level rail, but it was still functional. The Townhome was also lauded for ingenuity in its detailed work. The little home fittings and the night lighting feature makes playing lifelike. Plus, It allows kids to add mini dolls from other brands in their play as well as add-on other Calico Critters playsets to build a full town complete with characters. The Luxury Townhome toy was considered expensive. But most owners agreed the price is worth the quality which saves money from repeatedly buying low-quality toys that break in a matter of months (that’s if it holds kid’s interest for that long). And they look forward to adding on to their collection. Overall, the playset has been found to be satisfactory and well worth the investment. And I think the Calico Townhome is a great toy. And I recommend it to anyone looking to buy a good quality toy for their kids and a great collectible for miniature dolls aficionados. The toy animals and some furniture are not included in the house, and you can purchase them separately online or in stores. You can furnish the home according to your child’s tastes for a more personalized approach. If you want to use some of your existing miniature people, you can do so. There is a lot of possibilities that this townhouse gives you. The most popular critter sets are Calico Critters Deluxe Living Room Set, Deluxe Bathroom Set, Girl’s Bedroom Set, and Children’s Bedroom Set. Take home this townhouse for your kid, and she will undoubtedly be delighted. 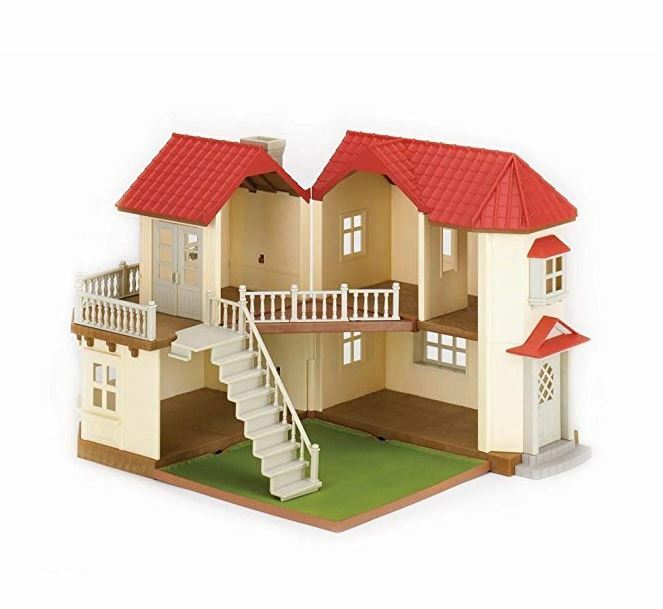 Purchase the toy animals as well so that your kid can give them a home in this luxurious house. Let her have hours of entertainment in this doll house that will surely help her learn and connect real events with her imaginative play.